When I was about 10 years old, I had great trouble getting to sleep. As the sleepless nights went on, I became more and more anxious – especially after I learned that I shouldn’t wake up my mother or father. However, it was always OK to wake up my grandmother. Granny would take me by the hand and lead me down the stairs to the kitchen, where she would heat up milk (her favorite medicine for sleeplessness) and then read me stories. There were just two books Granny would read from – the first was a pictorial history of Scottish heroes (her ancestors), and the second was an illustrated Bible. The Scottish heroes in my grandmother’s book were dashing and brave. 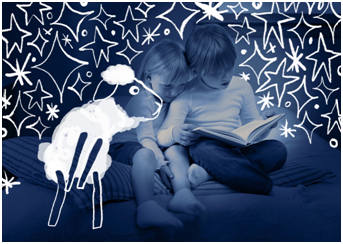 The great hero of Granny’s Bible was David, who was a shepherd, and – according to Granny – sang to his sheep. King David, Granny said, wrote the 23rd psalm for his sheep and for us. So with her help I began to memorize the psalm – and to learn the story it tells – because on those nights long ago, Granny was teaching me a deeper story, a story I learned by heart: There is a Love that will not let you go. Years later, when our son Andy was 13, he was preparing for Confirmation. The Rector had told the class they had to memorize the 23rd psalm – and he also told them they would have to pass a test on it before they could be confirmed. Now Andy had a learning disability and also found it almost impossible to focus on anything for longer than a minute. He began to panic about his inability to learn the psalm (he was sent home with the King James Version), and so I searched for a simpler translation that he could learn. So Andy went back to work until he finally learned the ‘real’ psalm, and he was able to be confirmed when the Bishop came. But the deeper story that Andy learned from all this was that God is the One who judges us, that God always finds us wanting. This was the picture of God that Andy carried for most of the rest of his life. Of course it’s important to memorize some poems, some songs, and some verses of Scripture as we grow up. I think of the first Christians, most of whom couldn’t read, but who all learned the 23rd psalm. Those early Christians painted frescoes of Jesus on the walls of the Roman Catacombs because hey pictured him as the Good Shepherd, the image of the Love that will not let you go. And I also think of a man taken hostage by terrorists in Beirut in the 1980’s. When he was finally released, reporters asked him, “How did you survive?“ He told them that he had remembered and then prayed the Lord’s Prayer and the 23rd psalm – both memorized in childhood. Those verses, those prayers, helped him stay centered through the darkest hours. When Andy died two years ago, I had great trouble sleeping once again. So one night, lying in the darkness and not wanting to wake up my husband, I began to practice ‘counting sheep’. But I was not picturing sheep, jumping one by one over a fence, but trying to remember the 23rd psalm, verse by verse. When I got to this verse, in the dark of that first night, I couldn’t remember which line comes first – is it the green pastures or is it the still waters? Finally I thought, Does it really matter? Both green pastures and still waters are always found in that peaceful place where God waits for us. The other night, I was in a small group at St. Paul’s Church in Cambria, reading the 23rd psalm together. One man in the group began to remember his childhood fear of the dark. As a little boy this man (now in his 80s with a deep voice and one of the patriarchs of the parish) was so afraid of the dark he could not go to sleep. So one day his father took him out into the woods near their house. 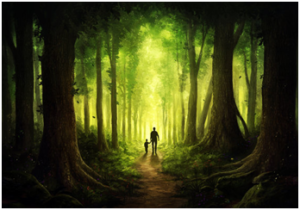 Together, hand in hand, they walked under the dark trees, day after day, until he was able to let go of his father’s hand and explore a little bit…. and until he was finally able to go to sleep in his own bed. Notice that this is no longer a poem about God; when we call God ‘You’, we have entered into a conversation with God. and I will dwell in Your house for ever.